“Nuh Beton A.Ş. is a young and dynamic representative of the industrial tradition maintained by Nuh Group of Companies since 1959. Nuh Beton A.Ş., as a separate activity of Nuh Çimento AŞ., started production in Bostancı facility in 1987, has decided to establish new facilities in parallel to the developments in the ready mixed concrete industry over time and Hereke in 1989, B.Bakkalköy in 1992 and also İkitelli in 1993 taken into service. It was concluded that establishing a separate company would be good idea to organize this fast-growing corporation better and the company was registered as Nuh Beton A.Ş. in February, 1995. Nuh Beton A.Ş. continued to grow after being organized as a separate company and expanded its area of service by opening B.Çekmece and İzmit facilities in 1995, Yalova in 1996, Adapazarı in 1997, Gölcük and Ayazağa in 2000, Gebze, Gemlik in 2007, Cevizli in 2010 and Cebeci in 2014. In recent years parallel to the developments in the construction sector, company has made a slogan that is ‘ be found where the work is’, the idea ‘projects within the facilities’ make further increased the efficiency and quality of services. So at present, Kılıç, Metropol and Tema Park in 2013, Göztepe SGK in 2014, also Zeytinburnu and Finans Merkezi in 2016, Kocaeli Sağlık Kampüsü and Derince in 2017 opened that live a dynamic process. Nuh Beton A.Ş., one of the founding members of Turkish Ready Mixed Concrete Association (THBB), provides support for civil society services such as the development of ready mixed concrete and construction sector of our company, awareness and protection of consumers, preparation of national standards, training of contractors, engineers and technicians and publication of technical books and magazines. Furthermore, product and service quality and environmental sensitivity of Nuh Beton A.Ş. 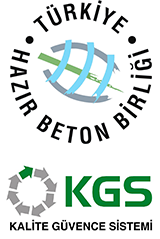 is under constant control of “THBB-QAS Quality Assurance System” and is registered with Quality Assurance Certificate, “Yeşil Nokta” Environmental and “Mavi Baret” Safety Awards. Our company always follows up new technologies in order to provide better and more efficient services to customers and this perspective forms the focal point of an endless effort shared by all employees.